This past weekend I was blessed to participate in a pre-Lenten retreat at St. John Orthodox Church, my parish here in Memphis. The topic was “The Sermon on the Mount: The Journey to the Kingdom of Heaven is a Staircase.” The speaker was H. Paul Finley, Director of the Saint Herman House of Hospitality in Cleveland, Ohio. I’ve known Howard for many years. In fact, fourteen years ago he married my best friend from St. Peter Orthodox Church in Jackson, Mississippi, Deborah Callaway. It was a joy to have both of them with us this weekend. Howard gave three talks during the weekend, but it was the first one, on Friday night, that really got my attention. Of course I’ve been familiar with the Beatitudes all my life. 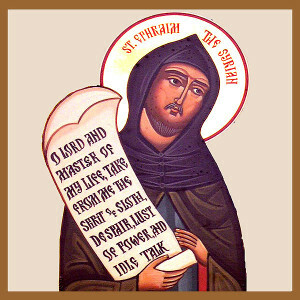 We actually sing/chant them during the Divine Liturgy every Sunday at St. John. I’ve always thought of them as something ethereal, poetic, and beautiful, but I’ve never seen such a practical application to my daily life until Howard’s talk. 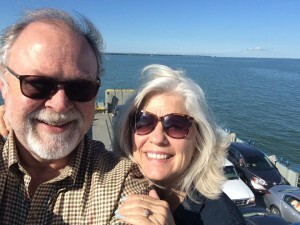 On Saturday Howard expanded these steps, giving us tools to embark on the journey with the right attitude, three spiritual exercises to stay in shape, emphasis on the importance of trusting God, and warnings, which he calls seven spiritual traps. 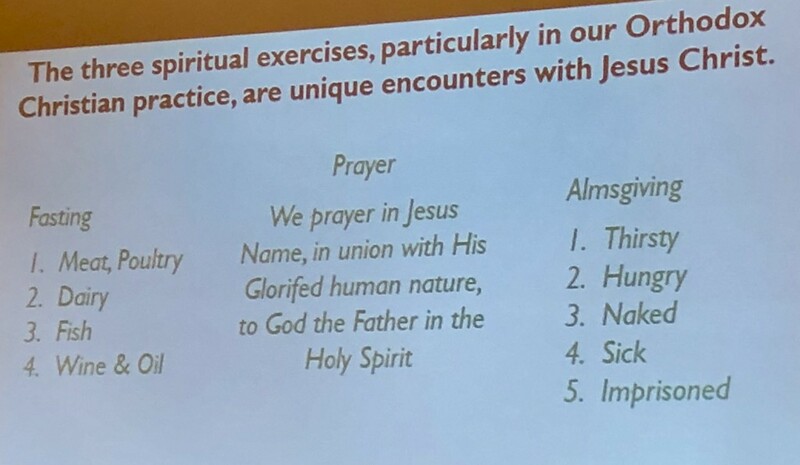 The three spiritual exercises weren’t new to me—prayer, fasting, and almsgiving—as they have been taught in our church for many years. But the way he showed us to use them in our struggles against our vices was really wonderful. If you’ve been reading my blog very long, you know that I have struggled with disordered eating for most of my life, and also that I have problems embracing fasting as it is prescribed by our church. 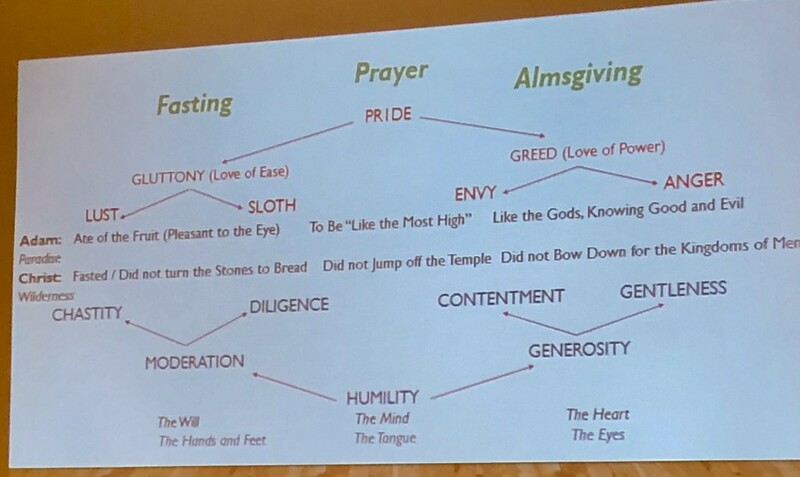 Howard’s words (he’s quite a preacher, by the way, so these notes do not adequately capture his inspired talks, which, coupled with his humility, were so truly life-changing) gave me hope that fasting could help me with gluttony. I’m including pictures of two of his slides here, so you can see how he organized these thoughts. 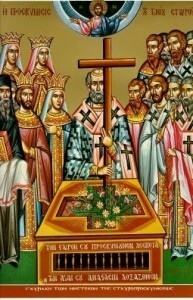 One week from today, Orthodox Christians begin Great Lent with Clean Monday. Western Christians (Catholics and protestants who observe Lent) start their Lenten journeys on February 14, Ash Wednesday. 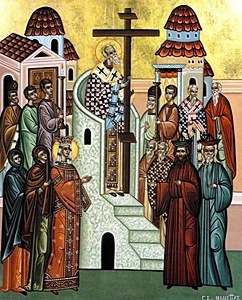 Orthodox Easter, which we call Pascha, will be celebrated on April 8 this year, whereas Western Easter is April 1, one week earlier. I look forward to joining all my friends in every religious tradition on our Lenten journeys this year. One thing I know we all have in common is the desire to serve, to help others. One way we do this is by giving alms. 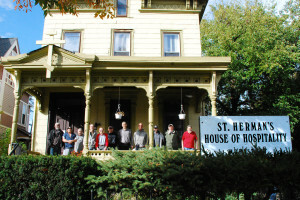 If you’re looking for a place to support that helps others in a wonderful way, please give to the Saint Herman’s House in Cleveland. They house around 40 men who would otherwise be homeless, and they also help with meals, clothing, and occupational counseling. Here’s a video that shows more about this wonderful ministry. CLICK HERE to learn how to make a financial donation. Thanks for reading! I look forward to hearing about YOUR Lenten journeys… please leave a comment here or on Facebook. Like everyone else, I’ve been watching the horrific images of the devastation that Hurricane Harvey and the subsequent flooding are doing to the Houston area and be beyond. Before we had such immediate images available to us, tragedies that happened far away from our homes didn’t seem as real. Now we often feel that they are in our backyard, and we (hopefully) respond with greater empathy. 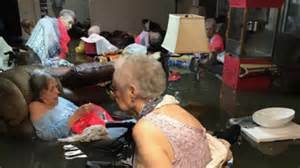 Of course the image of the people in the nursing home brought me to tears, especially since my mother was in a nursing home, helpless, in a wheelchair, for the last eight years of her life, so I could only imagine the emotional and physical toil it caused those elderly people to be trapped like that, watching the water rise up above their waists! I’m not in a position to go and help out physically, but my husband I decided to contribute financially. Of course there are many options for doing this, and sometimes it’s hard to know which ones to trust, and which ones will be most efficient in delivering your contribution directly to the people who need it most. We are Orthodox Christians, and we decided to contribute through an organization known as IOCC—International Orthodox Christian Charities. Here’s a link explaining how they plan to help, with a button you can push to donate. 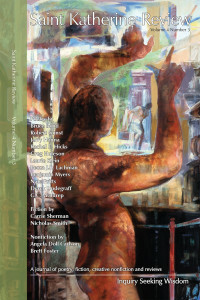 I’m off to Atlanta for the weekend, where I’ll be on a panel at the Decatur Book Festival at 3:45 Sunday afternoon for the book I edited, A SECOND BLOOMING: BECOMING THE WOMEN WE ARE MEANT TO BE, along with contributor Jessica Handler. The weather report looks good, thankfully, since this is the largest independent book festival in the country. But I’ll continue to think about and pray for the people who are suffering in Texas. Please join me. On Sunday afternoon when I dropped into my local boutique grocery store, Miss Cordelia’s (in Harbor Town, on the Mississippi River in Memphis) I was stopped in my tracks by this beautiful display of colorful hand-woven baskets in the front of the store. 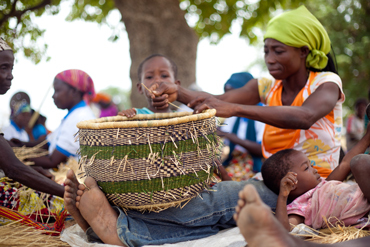 They are part of The Blessing Basket project, which helps end poverty in Bangladesh, Ghana, Madagasgar, and Uganda. 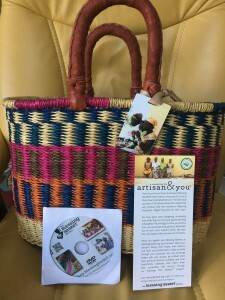 My basket came from Uganda. When I registered my basket on the web site, I “met” my artisan, Nsoh Adogyoo. I have used my Prosperity Wages to provide food for the family and register for national health insurance scheme for the family members to access health care when one falls sick. I have also used my wages to pay admission fees for my daughter who has gained admission to Senior High School this year. The changes I have seen in the community are that now our children are in school and we can feed them as well. I have also seen that now our children are entering into higher institutions like universities, polytechnics, and colleges of education because of the inception of BBP in the community. Thank you very much for giving us hope for our future of our children. You buy our baskets and now we are happy with each other. Thank you and May God bless you. The web site has a place where you can write a letter to your artisan, so I just sent one to Nsoh. They will read it to her. I told her that I am a writer and that I am using the basket to carry books to deliver to people and to put in the mail. 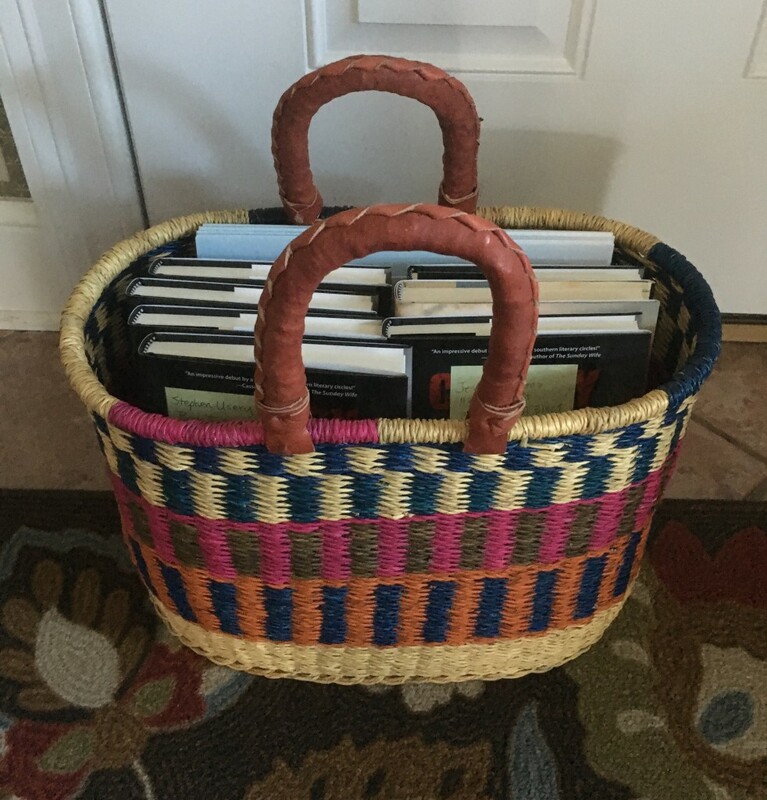 The basket she made is so sturdy—it can easily carry 8-10 hardback books. If you’re interested in purchasing items (they’re gorgeous) from the Prosperity Shop, just click here. I’m so thankful to have discovered Blessing Baskets. Maybe a good “Christmas in July” idea…. Faith on Friday: Are We There Yet? 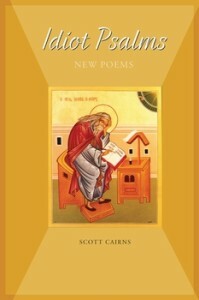 Continuing my journey through Lent with reflections from God For Us: Rediscovering the Meaning of Lent and Easter, I want to share a bit from the pages authored by the Orthodox poet and theologian, Scott Cairns. 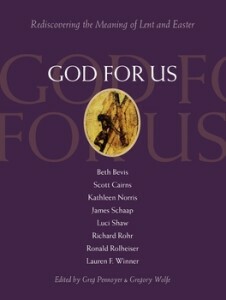 The essays on each day of Lent are written by different authors. Scott’s reflections are especially meaningful to me, probably because we share the Orthodox spiritual tradition. And also because he is a friend. And a poet. It’s already the third week of Great Lent… we’re approaching the half way point of our journey. For some of us—those who have struggled to keep the fast, to live a more ascetic life, to pray more, eat less, love more, and forgive—the journey has been exhausting. For others maybe it’s not been so different than the rest of our lives. Those who have been reading my blog for several years know that I typically do “Lent Lite.” And this year has been the same. I’m not a strict faster. And I’m pretty lazy, spiritually. But I have striven to love more and judge less. I must say that it took me a few years before I finally began to understand the efficacy of the Lenten fast; it took a good three years before I would come to know this somber period of preparation as a blessing. Repentance. Not a word most of us like to think about frequently. But without it, we can’t really move forward. And moving forward, as Cairns says—“Don’t beat yourself up”—doesn’t necessarily mean going to extremes in our ascetic efforts. Much of the Lenten journey—the long and slow-moving services of the church, the dark vestments, and (most importantly) the coupling of prayer with fasting, and of fasting with almsgiving—has a way of quieting distractions and centering our minds within our hearts. These disciplines reconnect our minds to our bodies, assist our re-pairing our parsed and scattered persons into souls made whole; they also recover for us our often-overlooked connection with others. I love that he adds that last part—about our connection with others. If we try to go this ascetic path alone, it’s not always fruitful. It needs to also be about love and forgiveness and alms and healing. And those things require the other—someone other than ourselves in the equation. For blessed art Thou, unto ages of ages. Amen. 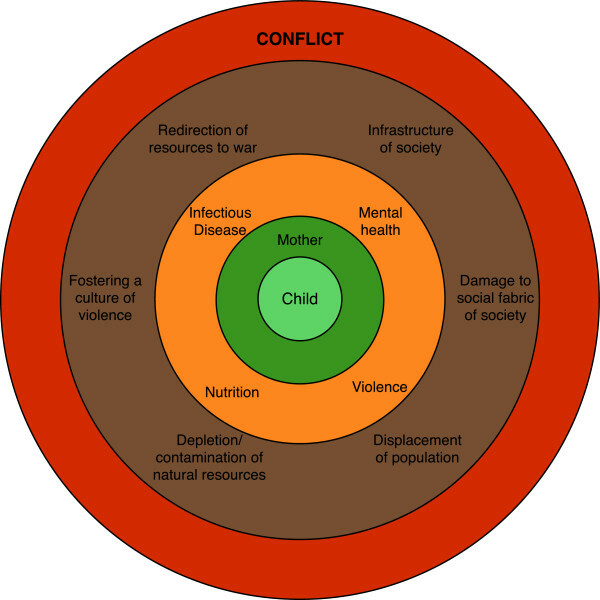 Mental Health Monday: How Can You Be SHOPPING? 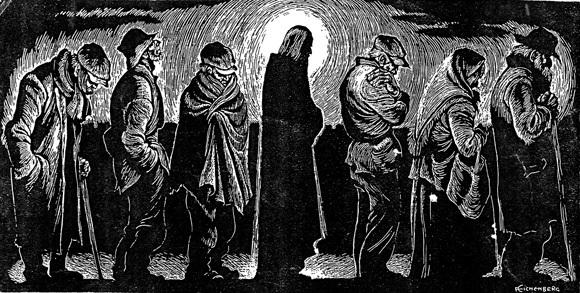 Last Monday I said that one of the themes I would be following in my Monday posts leading up to Christmas is almsgiving: reaching out to others. Our parish in Memphis is putting together emergency kits to send to those suffering in Syria, Armenia and Iraq. They need baby kits, school kits and hygiene kits. 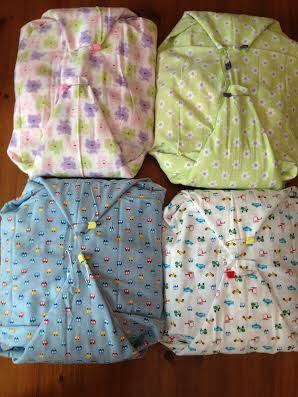 I put together several infant kits. 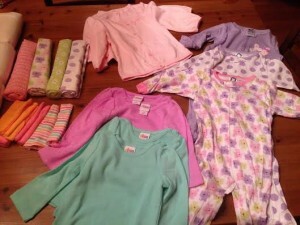 Shopping for those babies brought me great joy in the midst of shopping for my own granddaughters. But of course that’s only one of many ways we can help our fellow man during this season. I’m in New Orleans for a few days, and tonight as I was walking down Decatur Street, a young woman sitting on the curb near The Christmas Shop started yelling at everyone that passed by. She was talking about people who are suffering in Malaysia, and how we could be so selfish as to be SHOPPING while they are suffering? A group of women walking in front of me were carrying shopping bags. I hadn’t bought anything that night, but I had done some Christmas shopping the day before. I almost stopped to talk with the young woman, but I decided she was so angry she wouldn’t listen. What I wanted to say was that helping people who are suffering and shopping for ourselves or others aren’t mutually exclusive activities. I wanted to tell her that you can do both. 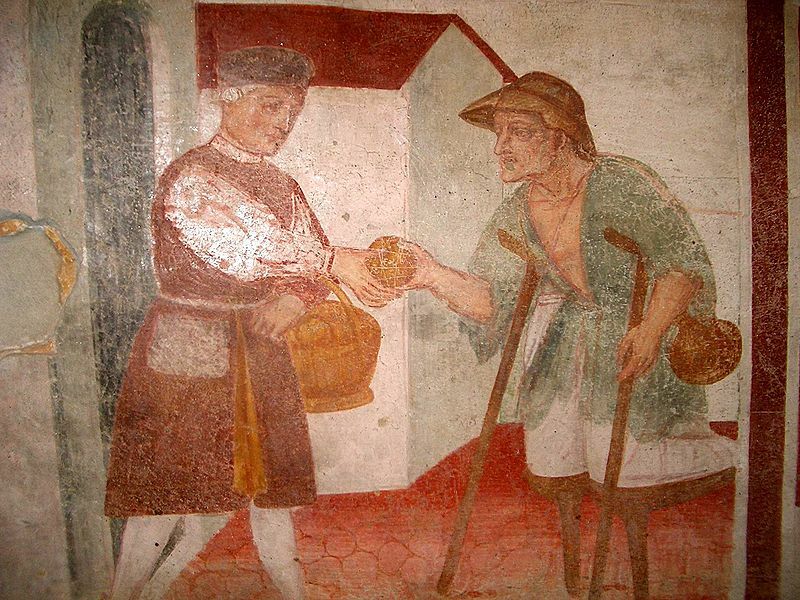 When our children were young, we decided to involve them in a hands-on almsgiving activity. I don’t think we were motivated by guilt—by the amount of gifts we would be giving our own children for Christmas—but by a desire to lead them into the practice of helping others. We “adopted” a family to help. It was a single mom with two young children. Their apartment had just burned down and they had nothing. We shopped for clothes and toys and food and took it to them in person. I’ll never forget the children’s shy happiness and the mother’s tears of gratitude. I tell this story to say that it’s not JUST sending money and other helpful items overseas (even to Malaysia) but it’s also helping the person right in front of you. 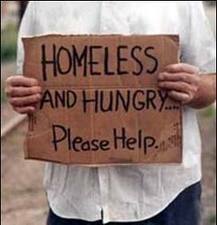 In your own city, or even the person begging alms on the street. The Christmas season is a great time to re-up our efforts to see these people as our brothers and sisters all throughout the year. Our parish has also supported the MIFA (Memphis Inter-Faith Association) Christmas Store for many years—donating new toys for needy families. But if you’re looking for a specific charity to support locally or nationally or internationally, there are plenty to choose from. Here are just a few I’ve found. Top 5 Christmas Charity Projects: Click the link to read more about them. More ideas are described here at All Things Christmas. If you’d like to share a link to one you are supporting, please leave it in a comment here on my Facebook thread. Thanks for reading! I was hungry and you gave me food. I was thirsty; you gave me drink. I was a stranger and you took me in, you welcomed me. I was naked; you clothed me. I was sick, and you visited me. I was in prison; you came to me. I love this, because almsgiving is the one part of the Lenten “tripod” (the other two parts being prayer and fasting) that I can most easily embrace. It’s an activity in which I interact with other human beings, rather than with myself (fasting) or with God (prayer). Just this past week I had two such interactions, and each one taught me something different. The first was with a man holding a sign at a busy intersection. The signed said “Hungry.” I quickly looked in my purse and found I had no cash. Then I remembered that I had a couple of “care packages” which our church had assembled, so I handed one out the window to the man. “I’m Susan.” I offered him my hand. It was a short interaction, but one with a very real human connection. A few days later a woman approached my car as I was leaving a parking lot. She began to cry and share her story. I listened for a few minutes—not because my almsgiving would be based on her story, but just to show her I cared about the things she was saying—and then I handed her a $20 bill. Thinking she would respond the way the gentleman to whom I had given the care package did, I was surprised when, instead of thanking me, she began to beg for more money. I wasn’t sure what my response “should” be, but I finally told her that $20 would be enough for two nights at the Union Mission (which was only a few blocks away) or for about 8 meals there. She began to argue about needing money for the bus to get to the mission, and I reminded her that the $20 was enough for that, also. Sad that she seemed angry rather than thankful, I rolled up my window and drove away, feeling that I could not do enough for her. I’m still a bit frustrated about that encounter, but we are both broken human beings, and so our relations are often messy. When Christ comes to judge us, what will be the criterion of His judgment? 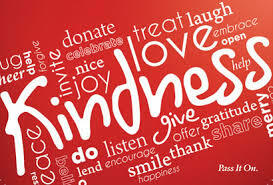 The parable answers: love–not a mere humanitarian concern for abstract justice and the anonymous ‘poor’ but concrete and personal love for the human person, any human person, that God makes me encounter in my life. Like the man and the woman I encountered on the streets this past week. I’m afraid I didn’t love the woman enough. Maybe I’ll do better next time. Judgment Sunday is also called “Meatfare Sunday” because it’s the last day to eat meat as we enter the Lenten fast. (The following Sunday, Cheesefare Sunday, is the last day to eat dairy products.) For 40 days. Yes. This week I’ve eaten lots of meat (much more than I normally do) and other rich foods. 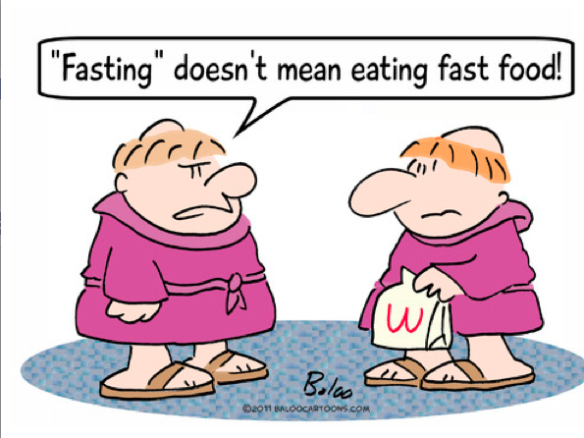 It’s not that I’m “storing up” the fat my body will need when/if I enter into the fast. It’s just that my husband had surgery a week ago, and people gave us food, and I also have cooked “comfort foods” for his recovery, like pot roast with rice and gravy, spaghetti with meat sauce. Today I’m actually looking forward to eating less. But I’m not sure it’s a spiritual feeling so much as a physical one. I feel fat and uncomfortable and I want to feel (and be) lighter. Maybe it’s all related. Maybe I will try to eat less meat this Lent. But more importantly, I’m going to try to lighten the burdens of the people around me. And I can make it seem better for awhile. 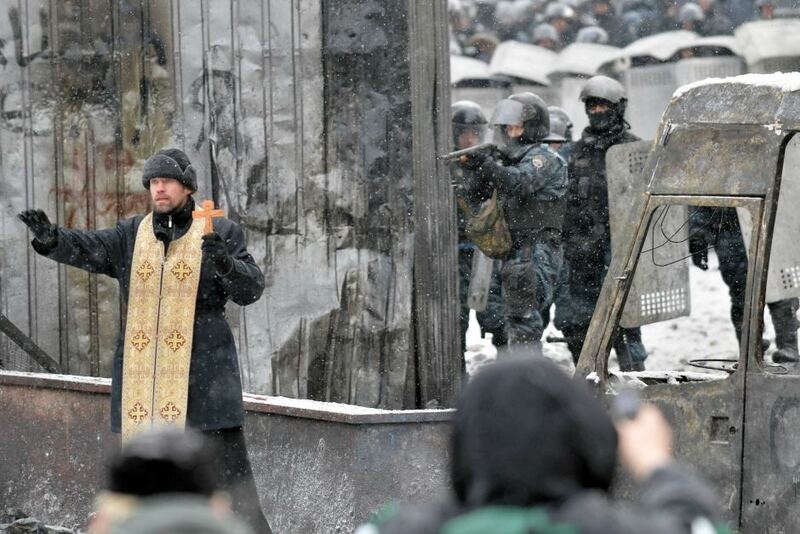 I’m sure by now everyone has seen this image of an Orthodox priest standing between the police and protesters in Kiev. There are many more images I could share, but this one struck me as a powerful picture of courage. Of faith. I’m sure this video only captures a small picture of what is happening there. I’ve never lived in a war zone. My faith has never been tested in this way, but I don’t think I would be so brave. 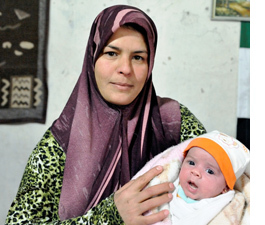 And with the world watching Sochi and the security issues surrounding the upcoming Olympic Games, I think it’s important not to forget those suffering in Syria. Our Orthodox parish here in Memphis recently participated with other parishes within the Antiochian Orthodox Church here in America to send aid to help the orphans of war in Syria. 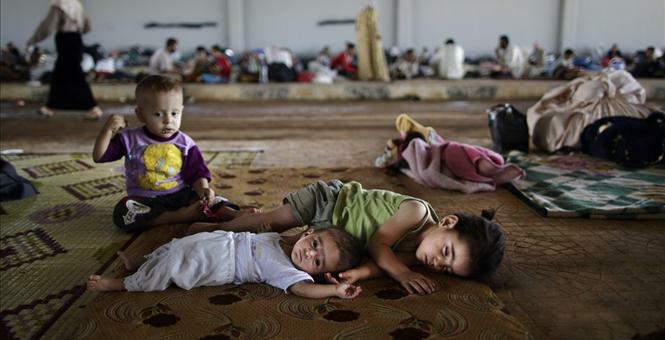 One account says that over four million Syrian children have been displaced throughout the country, thousands of them arriving in refugee camps without family. Our parish recently sent donations, but there are ways individuals can help. Check out SyrianOrphans.org, an organization that works inside Syria to hand deliver food to orphans and to help provide shelter. It’s hard to watch the news these days. 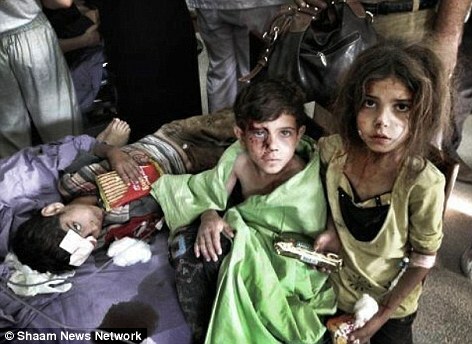 But once we see these images, aren’t we responsible to help? Isn’t that part of what faith does? Whether or not we can be brave, surely we can show kindness. Mental Health Monday: Countdown to Christmas! Someone posted a rant on Facebook the other day about how upsetting it was to see folks putting up Christmas trees before Thanksgiving. And of course there’s the big buzz about Black Friday creeping over into Thanksgiving day, forcing employees to work on the holiday and enticing families to leave their happy homes and enter the fray a day earlier than in the past. While I’m not sure these events are related—beginning Christmas preparations before Thanksgiving hardly seems the same as retail shopping on Thanksgiving Day—they both seem to hint at an underlying, perhaps national angst that many suffer this time of year. Which is sad, since Thanksgiving and Christmas are supposed to be times of joy, of celebrating family and for some, pious religious commemorations. So, what’s with the angst? Last year I wrote a post on Christmas Eve (from our son’s home in Denver) called “A Winter Dialogue.” It was inspired by a poem with the same name by Joseph Robert Mills, in which Mills describes in a lovely scene the need we all have to be touched. As I read it again this morning, it struck me to endeavor to touch those around me with compassion and joy as much as possible this holiday season. 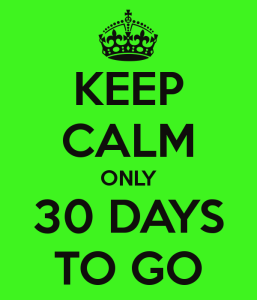 Looking at the calendar this morning, I realized that Christmas is only a month away—30 days to be exact. Those who commemorate the Nativity of Christ on December 25 are probably already counting down the days in various traditional ways in their homes and churches. I remember the fun of opening the windows on Advent calendars each day. (Here’s a cute homemade calendar.) 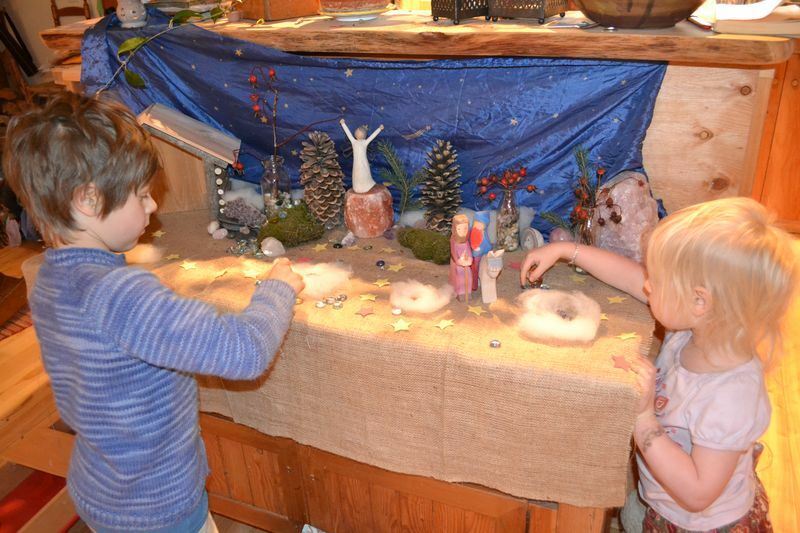 And I loved moving Mary and Joseph one step closer to the manger in our nativity scene each day. And then moving the three wise men closer each day to Theophany. So, where am I in this year’s Christmas preparations, as the countdown begins? GIFTS: I’ve bought about 95% of our Christmas gifts, many online purchases that could be shipped directly to Denver, where I’ll wrap them when we arrive a few days before Christmas. Others await wrapping and mailing or delivering here in Memphis over the next few weeks. I don’t have many stocking stuffers yet, but I enjoy browsing for those in stores where I can listen to Christmas music playing and enjoy the decorations. I’m a big fan of small businesses—especially bookstores—so lots of my gifting comes from such places. Please remember Small Business Saturday if you plan to shop this weekend! DECORATIONS: Since we’re traveling to Denver for Christmas, I’m not going to put up a tree this year. I’m also still recovering from my wreck and surgeries, so I have to pace myself with physical activities. I’m going to do a few simple, holiday touches in the den—including some new pre-lit willow branches with berries for our mantle—and try to enjoy the scent and glimmer of candles frequently as we spend the next few weeks preparing our hearts for Christ to be born in them again. Maybe I’ll put out our collection of Saint Nicholas figurines on December 6. ALMSGIVING: Oh! That reminds me, I need to pick up some toys to take to church on December 5. We celebrate Saint Nicholas Vespers and the teens put on a play, and we collect toys for MIFA’s (Memphis Inter Face Association) annual Christmas store for impoverished families. It was fun participating in our Thanksgiving baskets last week, and I hope the families we served will have more reasons to give thanks as they enjoy the turkeys and other goodies we delivered to them this weekend. 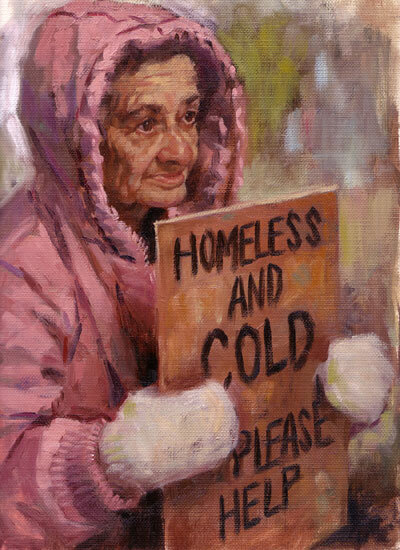 We might get some sleet in Memphis today, and as I’m snuggled inside my warm house, I’m remembering the joy of giving out blankets to people on the street a couple of years ago. Maybe I’ll pick up a few blankets and put them in the back of my car, since I drive through downtown Memphis almost daily, often right past folks who are in wheelchairs, or huddled up against buildings trying to get warm. Our parish is again putting together close to 150 bags of necessity items to give to the homeless this year. I love what Trinity Methodist Church, in my old neighborhood in midtown, is doing to help give the homeless a warm place to spend the night. 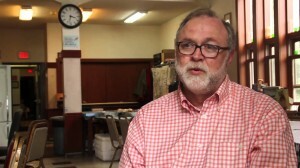 Read about them and other churches that are part of the Room in the Inn program. And here’s one more almsgiving opportunity I recently participated in, with a quick click of the mouse and without leaving the house. Please help Danielle Troup get a handicap van for college! MUSIC and ART: Last year about this time I did a post called, “Fighting the Holiday Blue with Music, Art, Food, Friends and Writing.” As I read it again today, I realize that I really want to get out and hear some live music and see some good art between now and Christmas. Any suggestions, Memphians? I hope you enjoy the next 30 days of preparation for Christmas… and aren’t too exhausted to enjoy the celebration that BEGINS on December 25 and continues for twelve days and beyond! I’d love to hear about your preparations and traditions.